BB Cream: The Next Big Thing In Beauty? One skin care product is generating a ton of buzz precisely because it addresses both the time-crunch we all face in the morning and our not-so-secret desire for flawless skin. BB Cream, which has long been the go-to beauty secret of women in Korea and other parts of Asia, is starting to gain momentum here in Canada. In a world where the faces of Elle MacPherson and Demi Moore look nearly as flawless as they did when they first hit the celeb circuit in the 1980s, it's not surprising a youthful look is in demand these days. But most of us don't have the access to famous dermatologists or thousand-dollar creams, so we have to figure it out on our own. And it can be tricky to navigate the seemingly endless array of skin care and beauty products that are available on the market. Our medicine cabinets are filled to the brim, and our time is precious. One particular skin care product is generating a ton of buzz precisely because it addresses both the time-crunch we all face in the morning and our not-so-secret desire for flawless skin. BB Cream, which has long been the go-to beauty secret of women in Korea and other parts of Asia, is starting to gain some momentum here in Canada, and at the rate it's going, it's only a matter of months (or weeks) until it's a must-have. But the real question is: Is it worth the hype? BB Cream -- the BB is short for "Blemish Balm," "Beauty Balm" or "Beblesh Balm" (stemming from a copyright on the word "blemish" in Korea) -- was originally developed in Germany in the 1960s by dermatologist Dr. Christine Schrammek, who was looking for an ointment suitable for patients who had recently undergone a peel or laser procedure. The product remained relatively obscure until it was brought to South Korea and Japan in the mid-1980s, where it became the favourite beauty product of a few well-known actresses and has been selling like hotcakes in recent years. In fact, BB Cream sales reportedly account for 13 per cent of the makeup market in South Korea, and BB Cream recently made its way to Europe and the UK, creating lots of hype this summer. Wondering what all the fuss is about? You're not the only one -- beauty blogs have been buzzing about the product for months and Google searches for the term "BB Cream" have gone up exponentially in the past year. The cream is all-in-one treatment/moisturizer/makeup hybrid -- it's meant to be soothing and ultra-nourishing to your skin while providing light, tinted, sheer-looking coverage (sometimes mineral-based) for your dark spots, acne and other facial blemishes. Variations usually includes a good SPF to protect your skin from the sun's rays and other environmental damage, while providing anti-aging and anti-inflammatory serums to the skin to make it look younger. Some formulations are made to treat problem skin, while others offer skin whitening or shimmer to give skin an instant glow. Some sources also claim that BB Cream actually has skin-regenerating properties, but according to one dermatologist, consumers should exercise their 'buyer beware' skills when choosing. 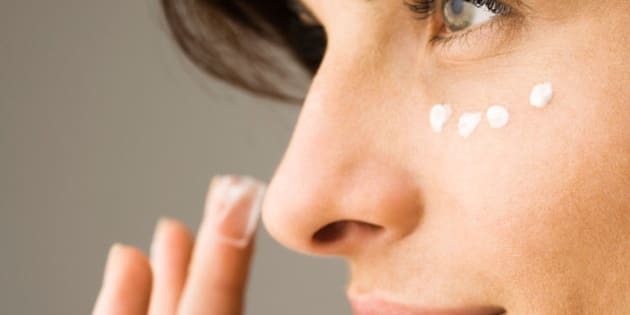 "I am skeptical that it would 'regenerate' the skin unless it was a retinoid-based product," says Dr. Jason Rivers of the University of British Columbia's Department of Dermatology and Skin Science. Buyers should take a few things into consideration when choosing a BB cream. As with any popular product, price can vary widely depending on brand, with some creams costing up to $50. Others are more affordably priced. Some Asian BB Creams come with lightening agents and others can be tricky to match to your skin tone -- they generally come in only one or two shades, so it may take a few test-drives to find the right one. You won't have to wait too long to buy in person -- North American versions of BB Cream are starting to hit the market, with versions from brands like Marcelle, Estee Lauder, Clinique and Garnier are slated for launch in Canada in early 2012. For those who just have to have it now, there's always the Internet, of course, and some Asian stores and markets in major Canadian cities may carry limited selections of popular Korean brands. The key to the BB Cream is to apply sparingly -- generally a pea-sized amount dotted on the forehead, under-eyes, nose chin and cheeks and blended well into the skin is enough to provide natural-looking coverage. Reviewers have applied BB Cream with or without moisturizer underneath and some finish off with a dusting of powder. Some have remarked they could replace their foundation with BB Cream, where others think BB is best suited to a natural weekend look and not meant to replace full foundation; others think it works well as a primer under their regular makeup -- it's whatever works best for your routine. Will you try BB Cream when it comes to Canada? Have you already tried them and use them in your daily routine? Let us know in the comments below.